What might those memoranda call for? 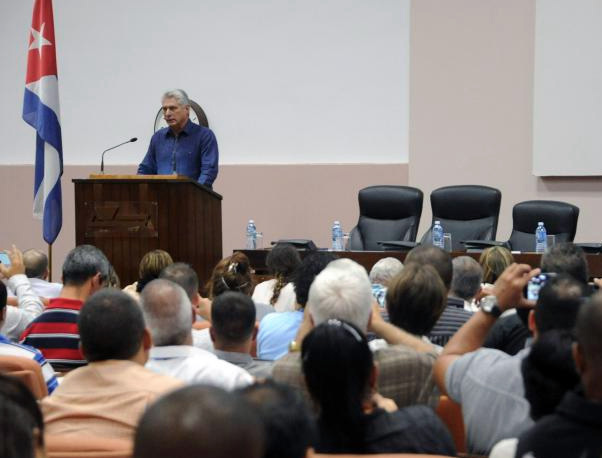 Cuban President Miguel Díaz-Canel addressed the first annual meeting of Cuba's IT professional society, the Unión de Informáticos de Cuba. In his talk, Díaz-Canel announced that four Cuban organizations — the Havana City Historian's Office, the University of Computer Sciences (UCI), Infomed, Cuba's medical network, and the Ministry of Culture had signed memoranda of understanding (MOUs) with Google. The President of the Councils of State and Ministers, Miguel Díaz-Canel Bermúdez, during the closing of the First National Conference of the Cuban Union of Computer Scientists (Photo: Estudio Revolución)The Granma article on the talk (English, Spanish) did not say what the topics of those memoranda were, but Lorena Cantó of Agencia EFE told me she thinks the MOU with the Havana Historian's Office will have something to do with Havana's 500th anniversary and she reminded me of Google's previous multimedia tribute to José Martí. Canto also suggested that Google might be giving UCI access to Google Code and other tools. That would be cool, but involving them in an undersea cable project would be even better. Last June Senator Jeff Flake said Google was close to reaching an agreement with the Cuban government on a submarine cable, presumably from Havana to Florida. That would be of significant benefit to Cuba since their current fiber backbone connects to a cable landing point at the east end of the island, far from Havana and other populated areas. A second cable would improve performance today and reduce the future need for backbone infrastructure. What about the MOU with Infomed? Cuba has focused on medical research, training, and practice since the time of the revolution and Infomed, their medical network, predates Cuba's connection to the Internet. Could Google be offering hosting service or high-speed connectivity to Infomed? That would not only benefit Cubans but would facilitate access to Infomed's research, databases, and community from all Spanish-speaking and developing nations. An augmented Infomed could also be a valuable medical education resource. Finally, might the MOU with the Ministry of Culture call for Google to establish a YouTube production space in Havana? It would be close to the US and a natural place for Cuban artists, filmmakers and musicians to produce content for the Spanish speaking world. (They currently have YouTube Spaces in ten cities, none of which is in a Spanish-speaking country). Here is a look inside Google's Los Angeles production studio. This post has been 100% speculative — we'll have to wait to see what these four MOUs call for. For a Spanish translation of this post, click here. Local Time: Wednesday, April 24, 2019 09:17 PM PDT – Page Load: 0.2714 Sec.